Be Still and Know that Jesus is with You! Christ Belongs in School! I love to laugh, and one of my favorite Christian comedians is a gentleman by the name of Michael Jr. However, recently Michael Jr. posted a video regarding the birth of his daughter that had a very deep and thought-provoking message. The video shows his newborn crying in the incubator immediately after her birth. However, the baby stops crying as soon as her dad, Michael Jr., starts to speak to her and she hears his voice. Afterwards, he steps aside to let the nurse continue to take care of her, and the baby quickly resumes crying. However, once again, as soon as her dad starts to speak and reassure her that everything is okay and that he is still there, she stops crying. Even more powerful, Michael tells the soothed and calm baby that he loves her, and she immediately opens her eyes. At St. Matthew Lutheran School, we believe that faith development can begin at a very early age, and young children can hear and listen to the Father's voice. As a result, we place a very high value in our Early Childhood programs, where we can begin to lay the spiritual building blocks for children to become life-long learners and followers of Jesus. This Saturday, all Preschoolers and Kindergarteners are invited to our Preschool/Kindergarten Open House! During this event, your family will have the opportunity to see some of God's amazing animals during "The Little Creatures Company" live animal show. It is also our hope that current families will also be able to mingle with inquiring families and share about their experiences at St. Matthew. Many times, our current parents are our best marketing resource! 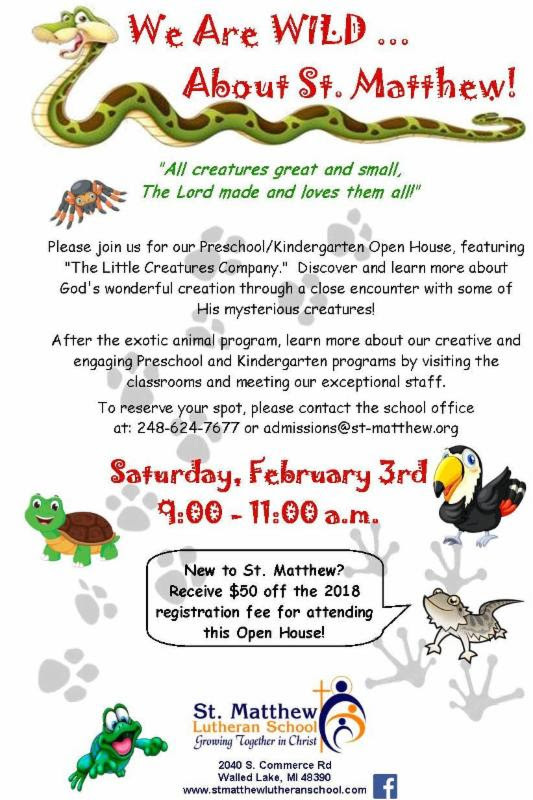 To reserve your spot and join us for this free safari... please contact the school office or admissions@st-matthew.org. Come and join the fun as we spend the morning being WILD about St. Matthew! Please click here for the Little Creatures link.